As the battle for Mosul looms, Middle East watchers are focused on the nearby town of Tal Afar, where Iran and Turkey are making a play for increased influence in northern Iraq. 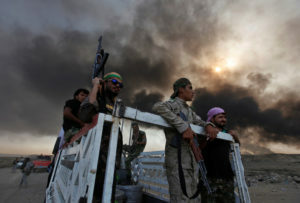 Iraqi Shi’ite militias, who are backed by Iran, on Oct. 29 began to move toward Tal Afar in an effort to sever the main route for Islamic State of Iraq and Levant (ISIL) jihadists moving between Mosul and their bases in Syria. The move is likely to draw Turkey deeper into the regional battle. Tal Afar, a former Ottoman outpost, has a mostly ethnic Turkmen population. The state-run Anadolu agency reported that Turkish President Recep Tayyip Erdogan told reporters that his government will be closely monitoring the behavior of the militia. “Tel Afar is an entirely Turkmen town. If Hashd al-Shaabi (Shi’ite militia) starts terrorizing it, then our response will certainly be different,” Erdogan said. Iraqi Prime Minister Haider al-Abadi agreed to allow the militias, also known as the Popular Mobilization Units, a secondary role of sealing off the desert areas west of Mosul, but not entering the city itself. Abadi said the militias could prove useful in catching ISIL fighters trying to flee Mosul, as well as any reinforcements the terrorist group might try to send in from Raqqa, its de facto capital in Syria. The fight against ISIL has given the militias new legitimacy and political power, even though human rights groups have accused them of revenge attacks against Sunnis during previous battles against the terrorist group. Turkey has stationed troops in Bashiqa, a town north of Mosul, to train Kurdish and Sunni Arab fighters. It did so without the approval of Baghdad’s Shi’ite-led government. While Sunnis are there now, Tal Afar was a Shi’ite-majority town before it fell to ISIL in 2014.